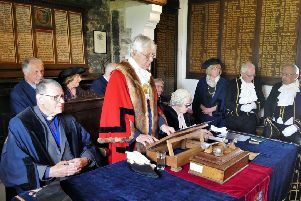 The new High Sheriffs of West and East Sussex began their year in office with a formal Declaration Ceremony at Lewes Crown Court on Friday – continuing a tradition which stretches back for more than 1,000 years. Mrs Davina Irwin-Clark, from Handcross in West Sussex, and Mrs Violet Hancock, who lives in Ringmer in East Sussex, will both serve as The Queen’s representatives for law and order in their counties, lending active support to the judiciary, the police and other emergency services. They will also take an active part in supporting and promoting local voluntary organisations. The two High Sheriffs were joined in court by the Lord-Lieutenant of West Sussex Mrs Susan Pyper and The Lord-Lieutenant of East Sussex Mr Peter Field, Chief Constable of Sussex Giles York QPM, senior judges and representatives of the emergency services, county dignitaries and family and friends. Each delivered their Oath of Declaration in front of the Presiding High Court Judge for the South-Eastern Circuit, The Hon Mr Justice Edis. The voluntary appointment is for one year; Mrs Irwin-Clark succeeds Mrs Caroline Nicholls DL of Worthing in West Sussex, while Mrs Hancock takes over from Major General John Moore-Bick CBE DL, from Ewhurst Green in East Sussex. Mrs Davina Irwin-Clark grew up in Sussex, and now farms in Handcross. She has served with her husband Peter, a now-retired vicar, in many parishes including in Brighton and Worthing. She has therefore been deeply involved in the voluntary sector and the Christian faith community all her life. She wants to encourage community life in small villages as well as in our larger towns. Mrs Violet Hancock has a BA in French Literature from the University of Pennsylvania and a Masters of Business Administration from Columbia University in New York. Her background is in finance and international business. She has worked as a consultant for small businesses and has been involved for many years with the voluntary sector in Sussex, a county for which she holds a deep respect. Mrs Hancock is a Patron of Sussex Heritage Trust, having served as a Trustee for many years. Each High Sheriff appoints an Under Sheriff for the year to assist them in their duties. This year’s Under Sheriff for both counties is Mr Kevin Smyth, from Ditchling, a solicitor, commercial mediator, a trustee of the Martlets Hospice in Hove and a former chairman of governors of Worth School. He too delivered his Oath of Declaration in front of the Presiding Judge. The High Sheriffs have also appointed a Chaplain for each county: The Reverend Peter Irwin-Clark of Handcross, West Sussex; and The Reverend Jim Horton of St Nicholas, Saltdean, East Sussex. The Office of High Sheriff is an independent non-political Royal appointment for a single year. The origins of the Office date back to Saxon times, when the ‘Shire Reeve’ was responsible to the king for the maintenance of law and order within the shire, or county, and for the collection and return of taxes due to the Crown. While the duties of the role have evolved over time, supporting the Crown and the judiciary remain central elements of the role today. In addition, High Sheriffs actively lend support and encouragement to crime prevention agencies, the emergency services and to the voluntary sector. In recent years High Sheriffs in many parts of England and Wales have been particularly active in encouraging crime reduction initiatives, especially amongst young people. Many High Sheriffs also assist Community Foundations and local charities working with vulnerable and other people both in endorsing and helping to raise the profile of their valuable work. High Sheriffs receive no remuneration and no part of the expense of a High Sheriff’s year falls on the public purse.